The next time you need a reminder of how wonderful your brain is, go check out some of Juan Ferreyra's artwork. 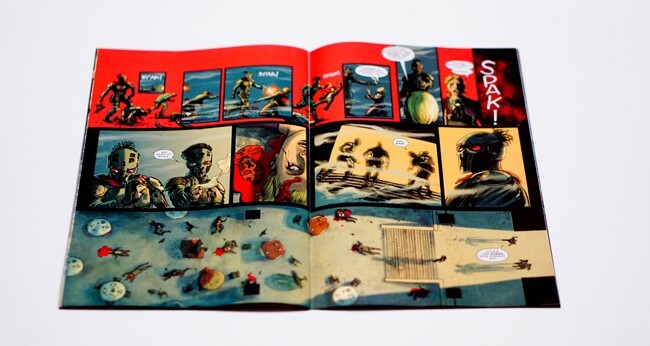 In particular, go look at some of his double-page spreads. Your ability to process all of the visual information in those images will give you an indication of just how fantastic this thing called a brain really is. I was looking and blogging about Ferreyra's work on Killmonger a couple of weeks ago, and I decided to discuss him again, this time with students in a comic book class that I'm co-teaching. Most of the students in the class are just getting underway with their first time reading comics. So I thought it would be good to introduce them to medium through aspects of Ferreyra's compositions. Whenever your eyes first encounter his spreads, your brain immediately begins trying to make sense of all that's happening. There's something known as preattentive visual processing where our sensory memory is interpreting images in less than 500 milliseconds before we are even fully conscious of it. What's cool about viewing Ferreyra's work and the works of countless other illustrators and graphic designers is that we're rewarded as we continue looking. As I was noting to the students, we can first take a look at Ferreyra's overall two-page spreads as a single image. Next, we can begin breaking down the piece in parts, one panel at a time, taking alternate looks at one of the two pages, and then taking a look from left to right. During all of this, our brains are seeking out patterns and making sense of the shapes, colors, spatial positions, and suggestions of motion. It's a testament to the power of our brains that we can absorb so many visual elements so quickly -- consciously and subconsciously. And it's a credit to Ferreyra's artistic talents that there can be so much delight and discovery as we pursue repeat viewings of the images.